On the way to the Black Sea the Danube is forced through the Iron Gate on the border between Serbia and Romania. 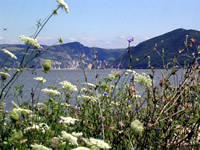 The section between Golubac and Tekija in Serbia is among the most beautiful sections of the Danube. A report by Reinhard Krenn. 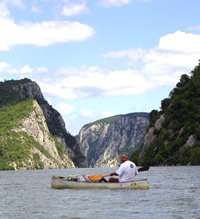 When the Danube leaves the Pannonia flatland at kilometre 1072, the river penetrates the Banater Mountains and is gradually locked between rock formations. The impressive fortress ruin of Golubac, from the 14th century, is at the beginning of the Iron Gate. Serbians, Romanians, Austrians and Turks argued about the ascendancy over the so-called "backyard of the Balkans" for centuries. At kilometre 972 one sees the entrance into the Veterani Cave, named after an Austrian field marshal. He heroically defended the cave area against the Turks in 1692, without to be able to stop them. At the narrowest place, at the entrance of the upper Kazan, the Danube is only 150 metres wide and 100 metres deep - the deepest river in Europe. That was not always so. Before the Hungarian Minister of Transport, Gabriel Baroz, regulated the Danube between 1890 and 1896, this section of the Danube was the most dangerous. The water gushed at eight meters per second through the Sip Canal, two kilometers long and 80 metres wide. The water rushed between cliffs in several twisted channels. But finally the Danube was curbed by the construction of the power station Djerdap I. The once-upon-a-time, dangerous Sip Canal is 50 metres under water today. The Roman Trojan plaque was moved about 40 metres higher to be above the artificial lake. 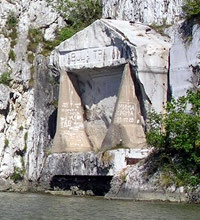 The plaque tells of "Nerva Trajanus Augustus Germanicus Pontifex Maximus", who overcame the river and the mountains to construct a road through the Kazan Canyon. In 1964, the construction of the power station Djerdap I at kilometre 941 began. The wild romanticism had been lost, one of the most splendid European fluvial topographies. Because of the buildup of water, approximately 8400 inhabitants had to be resettled along the Serbian bank. The overall length of the dam is 1278 metres. The backwater reaches to the emptying of the Nera at river kilometre 1075, and in rare cases, even to the Serbian city of Novi Sad (river kilometre 1254). There is a two-stage lock at every bank. Each chamber is 310 metres long and 34 metres wide. The slicing through both stages takes about 90 minutes. The participants of the TID were glad that the waiting period was shortened by listening to waltz sounds from Vienna and other songs from all over the world, played by TID musicians in their boats. 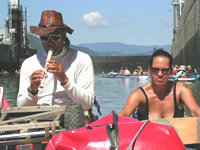 Waltz musicians in the lock of the Djerdap I dam. The beautiful landscape of the Iron Gate. Ruin Golubac - the entrance of the Iron Gate.